Although drugs that target HER2 have transformed the prognosis for many patients with breast cancer, the development of resistant disease remains a significant clinical challenge. Dual blockade strategies have become a new standard of care for HER2- expressing metastatic breast cancer and have also generated impressive results in earlystage disease. Now a growing appreciation of the complexities of HER2-positive disease is helping to further carve out a niche for dual blockade in HER2-positive breast cancer, including the possibility of a chemotherapy-free treatment regimen for certain patients. Although increased toxicity is a concern, the looming question for most clinicians and patients is whether insurance providers will cover expensive new combinations. As a result, the most pressing need is to identify patients for whom the benefits justify the cost. Meanwhile, researchers are also exploring dual HER2 blockade strategies in other malignancies, notably in metastatic colorectal cancer (mCRC), although clinical trial results thus far are limited. HER2 is a member of a tyrosine kinase receptor family that plays a central role in cell growth, proliferation, survival, and differentiation via multiple signal transduction pathways (Figure). It is overexpressed in many cancers. Initial FDA approval for trastuzumab (Herceptin) nearly 2 decades ago marked the beginning of a fruitful foray into targeted therapies for patients with breast cancer. Five drugs employing this approach have now been approved. In addition to trastuzumab, a monoclonal antibody (mAb), the FDA has approved pertuzumab (Perjeta), also a mAb; lapatinib (Tykerb), a small-molecule tyrosine kinase inhibitor (TKI); ado-trastuzumab emtansine (T-DM1; Kadcyla), an antibody–drug conjugate; and neratinib (Nerlynx), a kinase inhibitor. Thus far, the strategy has had limited success in other tumor types.4 Trastuzumab is also indicated for HER2-positive metastatic gastric and gastroesophageal junction cancer, while afatinib (Gilotrif), an EGFR inhibitor that also targets HER2, is approved for non–small cell lung cancer. The success of the first-generation drugs in breast cancer has been tempered by the development of resistance in a significant proportion of patients, which limits long-term efficacy. Among possible mechanisms of resistance is the incomplete inhibition of the HER2 pathway, allowing for low levels of signaling to persist. To overcome this type of resistance, numerous studies are now exploring the combination of 2 HER2-targeting drugs with distinct mechanisms of action. Most ongoing studies of dual HER2 blockade combinations are being conducted in breast cancer settings (Table). Novel combinations include the pairing of T-DM1 with neratinib, the latter of which the FDA approved in July as a single agent for extended adjuvant breast cancer treatment. Additionally, tucatinib, an investigational HER2 inhibitor that may be effective against brain metastases, is being evaluated in combination with T-DM1. Among HER2-targeting drugs, pertuzumab has set the pace for dual HER2 blockade strategies. It is approved in combination with trastuzumab and docetaxel for the first-line treatment of patients with HER2-positive metastatic breast cancer and as neoadjuvant therapy for patients with locally advanced or early-stage breast cancer. 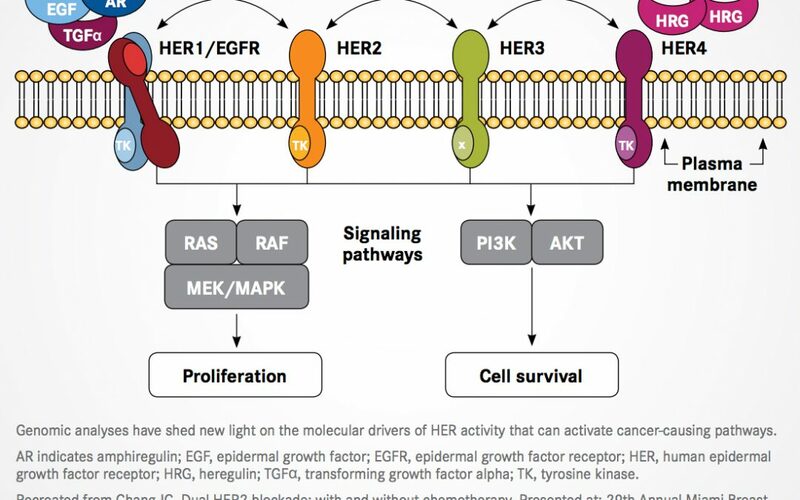 Although they are both mAbs, trastuzumab and pertuzumab bind to different parts of the HER2 protein and have distinct effects on HER2 signaling. The portion of the HER2 receptor that protrudes from the cell is made up of 4 subdomains. Pertuzumab binds to domain II, a region that is involved in the dimerization process, and prevents HER2 from being activated by other HER receptors. Trastuzumab, meanwhile, binds to domain IV, the exact function of which is unknown but which is not involved in receptor dimerization. Trastuzumab has been shown to block ligandindependent HER2 signaling and prevent HER2 cleavage. Both antibodies also induce antibody-dependent cellular cytotoxicity.